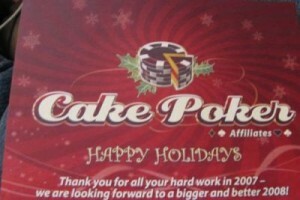 Despite only being in existence for approximately 18 months, I firmly believe Cake Poker are one of the best poker rooms to promote. US-friendly, very fishy players, excellent marketing department and great promotions, and one of the best affiliate departments to boot. I originally dealt with Rob at Cake and now Shenaz, and the two of them have been absolutely incredible when it comes to helping me and my players out. These are people that care more about the bottom line – they care about their affiliates and their players too, and have fast became the best affiliate department I could ever hope to work with. 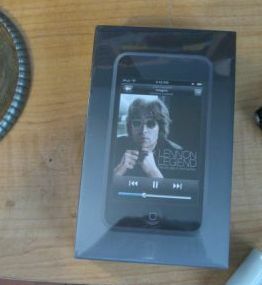 …as Cake had sent me a nice little christmas present, which was an Ipod Touch.This is fantastic for so many reasons, and hopefully any poker room or affiliate managers out there can take note. First of all, it’s obviously awesome to just receive anything for free, and an Ipod Touch to boot was, pardon the pun, a nice touch. Secondly, it’s a little extra that tells the affiliate that they appreciate all the hard work that we put in, and encourages to do more. However most importantly, it helps create the most important thing to a poker room: brand loyalty. To many affiliates, it’s all about money. A poker room isn’t doing well? Drop ‘em and go with someone else! How many people still promote Carbon Poker as strongly, now they no longer have epassporte? How many people don’t promote Full Tilt Poker much anymore, due to the amount of fees? Remember when the UIEGA came down, and Party dropped all US players? Hundreds of affiliates immediately dropped them, to focus on US-only rooms. 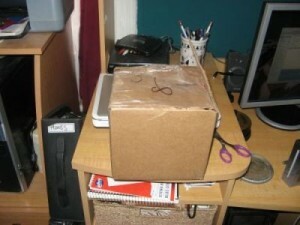 However by sending a gift like this, not only is it a hell of a nice thing to do, but it makes me appreciate Cake a hell of a lot more. When I’m looking at rooms to promote on a new site, Cake will always be at the top of my list. If Cake ever runs into problems like having to lose all US players, or just general PR issues, things like this are what will keep me promoting them regardless. If Absolute Poker had sent me ANYTHING to show appreciation for my hard work, I would’ve thought twice about dropping them from my sites(at least as fast as i did), because I would’ve felt loyalty to that brand. However instead my experiences with Absolute have been poor e-mail communication, and a planned meeting at the CAC 2007 that never happened as I never had my calls returned. These small factors, can weigh in to your mind when it comes to decisions about promoting a room, and how strongly. When the UIEGA happened and the Boss Network dropped all US players, I could have easily dropped Fortune Poker from my list of sites to promote. However I’d created a friendship with the poker room manager James, we’d talked on the phone for many hours, shared baby pictures etc, and my loyalty to him caused me to continue to promote them. So thank you Shenaz, thank you Rob, thank you Cake Poker. Not only have you given me a fantastic gift, but you’ve shown just how much you appreciate my work, and in return I’ll simply work a lot harder in 2008. This article was written on December 20, 2007 however all articles are looked at on a monthly basis and updated to keep them relevant.